Geri Allen, who died on Tuesday, is remembered by fellow pianist and composer Liam Noble. I started here. Open On All Sides In The Middle. When you put a CD on, I don’t know if you all remember this, you have a few seconds to go and sit down and prepare yourself. I jumped before I even made it to the chair. This music is as good as its word; it starts “in the middle”, and chops and changes at will, one insanely catchy groove after another, layers of angular melody, constantly changing pace. It’s like jumping in the sea, there is no preparation, it is just there. Above all, it doesn’t wear its cleverness on its sleeve. Of course, it is clever, but to conceal that, to spare the listener the gory details of its construction, that takes a whole lot more cleverness than just cleverness. There is no more important quality in music. Records like Twylight and Maroons fiz with this energy too. I struggle to find a word to describe it, and settle on African. To a guy who grew up in Bromley, Africa is a magical, far off continent, it’s almost mythical, beyond my grasp… but the music seems to be right here. It seems to consist not of notes but of living things, regrouping and reforming in constantly changing configurations. 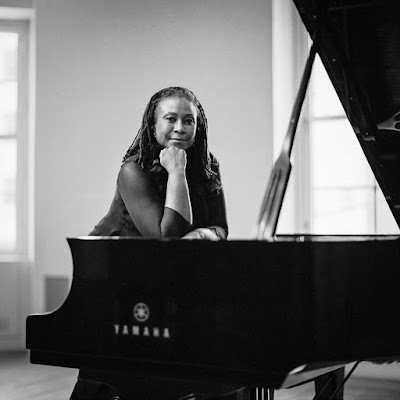 When I heard Geri Allen’s Twylight for the first time, I saw a big open field of possibilities, ways of using Western harmonies with African rhythmic systems. Her’s was a very generous influence; it didn’t say “look what I did”, it said “I found this, now you look, there’s more”. Two other musicians that share that quality with her, Charlie Haden and Paul Motian, formed a trio with her that made us all re-examine what a piano trio could do, what playing jazz repertoire really meant. Their version of Charlie Parker’s Segment is not on YouTube; go and buy it. Listen to the holes they find in that tune, the way she appears almost absent-minded in her improvising, the past and the future revolving in her silk-spun lines. She often plays straight out of the mainstream jazz tradition too, but the turn of phrase is unmistakable, the lightness of touch and the singing weight in her right hand. I never met her, excepting a mumbled “thanks for the music” at Ronnie’s one night. She was very gracious, especially as a nearby couple, seemingly overtaken by the sensuousness and libidinous rhythms of the evening and unaware of the presence of a legend in their midst, seemed to be actually copulating on their table. Who could blame them? On another occasion, I demanded my money back at the Jazz Café after finding out she wasn’t on the gig as advertised. There was a dep, he was a good player, fast fingers and everything, but Geri Allen is Geri Allen. No one else does what she does.